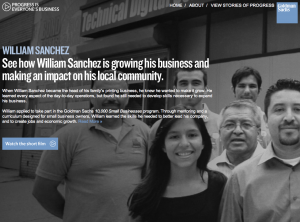 Goldman Sachs has a website about… small business? My good readers, I’ll leave this one up to you to decide if this is a genuine reach-out to the small business owners of America, or just a PR attempt as they continue to, well, do whatever Goldman Sachs does. Which traditionally, has had very little to do with small business. Check out their website for small business owners. Great PR, or a great appreciation of small business owners? I would like to ask the questions though – did Goldman ever have to ask the small business administration for a loan or worry about making payroll? Hmmmm. No disrespect to a great financial institution, but this one I’m not so sure I get. This entry was posted in Small Business and tagged Goldman Sachs, small business by John Sung Kim. Bookmark the permalink.